It’s cold and dreary here today. I know I shouldn’t complain, and that we need the rain. I am just feeling bad for myself! My allergies are killing me and I have bronchitis. Yuck! So I decided I needed some good old comfort food. I made some chicken for the week as I always do. CROCK POT CHICKEN FOR THE WEEK. 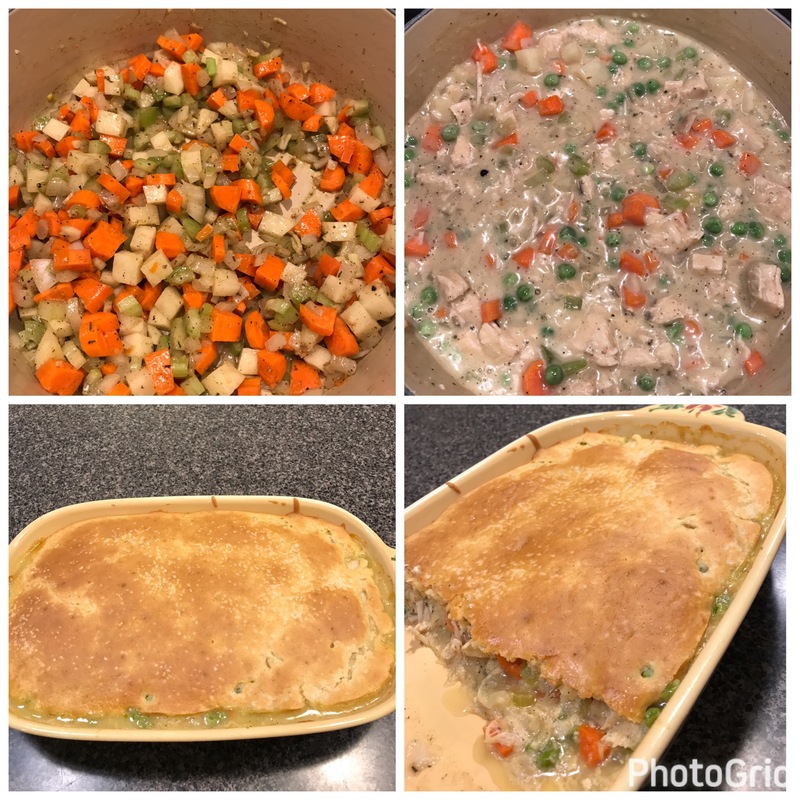 I have been making chicken pot pie for years. Today, I tweaked it a bit so that it fit into my weight watchers plan. It comes in at 8 smart points per serving. It’s hardy, tasty, and definitely comforting. It will also be good tomorrow in my lunch since there will be plenty left over. As my husband says, “I love when we are on a diet”. Enjoy!!! 1. In a large skillet over med heat, add the Olive oil and the lite butter. 2. Sauté the onion and garlic for about 2 min. 3. Add the carrots, potatoes, and celery and cook until lightly tender. 4. Season the vegies with salt, pepper, and poultry seasoning to taste. 5. Combine ½ of the evaporated milk, splash of sherry, and the flour, whisk to blend, then slowly add to the vegie mixture, cont cooking until it comes to the boil. 6. Slowly add the chicken broth and cont to cook until it comes to the boil then reduce the heat and cont to cook until sauce thickens. 7. Add the chicken and the peas. 8. Pour into a 9×13 casserole dish that has been sprayed with cooking spray. 2. Pour on top of the vegetable mixture in a zig-zag motion. Spread gently with a rubber spatula. 3. Sprinkle lightly with salt. 4. Bake for about 30- 45 minutes or until the crust is golden brown. Easter at our house was wonderful. The weather was perfect and the food was divine. It was nice to have everyone here and have some down time. Of course down time for me is cooking and feeding my family. I did have some help this year. I conscripted my oldest to help me make the traditional ravioli we have every Easter. Making pasta is all about the dough, much like bread making. Once you make it a few times you will wonder why you didn’t try it sooner. There are so many ways to use fresh pasta. All it requires is flour, eggs, and a touch of water. Of course, some time is required to knead it into a work of art. You can fill your ravioli with anything you like. Your dough is your canvas so create flavors you love. One of our daughters has a cheese allergy. We made her a spinach and chicken ravioli. Honestly, I wish I had made more of those! They were fantastic! I won’t lie to you, it does take some practice, but if I can do it, anybody can! My father and mother in law taught me a few years ago. In fact, my pasta roller, which is a hand crank, was given to me by them. Pasta rollers can be hand crank, electric, or an attachment for your Kitchen Aid. I have the attachment. There’s just something so satisfying in hand cranking my dough into long, billowy, sheets of heaven. It’s personal preference, either will produce the same product. Again, it’s all about the dough. This is a basic egg dough recipe. It rolls beautifully, shapes easily, and it is very tasty. A blank canvas waiting for you to do what you want with it. So, whether it’s ravioli with your favorite filling, or cut into strips for noodles, it’s worth the effort. You will never want to buy store-bought again. Measure out the flour and place into a large bowl. Beat the eggs together in another bowl and add in the olive oil and 1 T of water. Pour the wet ingredients into the flour, toss and mix everything with a fork until it starts to clump together. Lightly flour your hands, gather the clumps in the bowl, and begin kneading right into the bowl. It will be a shaggy mess just keep pushing and folding it over again and again. Make sure to get the flour off the sides of the bowl during this kneading process. When you have a cohesive piece of dough, remove it from the bowl and continue to knead it for about 2 or 3 minutes or until the dough is smooth and shiny, and there are no lumps present. If the dough is too sticky, add additional flour in small amounts, if it is too dry add a little water a few drops at a time, and continue to knead it until you get the desired smooth and shiny look on the outside and stretchy on the inside. Form it into a disc and wrap it in plastic wrap and let it rest at room temp for an hour. It can also be stored in the refrigerator for a day, make sure it is tightly wrapped. Just let it return to room temperature before attempting to roll it out. In all honesty you could even use a rolling-pin. You know my preference! Just make sure the dough is at room temperature. Work with one piece and keep the other covered to prevent drying out. Have a large sheet pan dusted with cornmeal, so you can lay your dough out and prevent sticking. Using a pasta machine set the rollers to the widest setting, for me that’s a 7. Press the first piece of dough into a disc and fold it in half, and run it through the machine at least two times, if it is sticking add a little dusting of flour to the rollers and continue. Fold the elongated piece of dough into thirds and turn the dough 90 degrees so the fold is on the side and roll it through. Repeat rolling and folding in this manner for a total of eight times. This is like kneading and will make your dough more pliable. Set your machine to the next setting down and run it through, you will see that it widens, no more folding! Catch the strip as it comes out being careful not to push or pull the dough. Let the machine do the work. Continue to decrease the setting down and running the dough through until you reach the desired thickness, being careful it doesn’t tear or stick. You should nearly be able to see through the dough strips. Our traditional filling is made with Ricotta. There are many fillings on Pinterest and on the web. Lidia Bastianich has a cookbook out called Lidia’s Family Table. I highly recommend it. It is loaded with great instruction on pastas and fillings. But I will give you the one we use. Mix all together and taste it to see if you need to make adjustments. When done, fold the dough in half over the filling, pushing the air out with your fingers as close to the filling as you can without mashing the filling down. Using either a sharp knife or a pastry wheel cut between the fillings evenly making individual ravioli. Using a fork, crimp around all of the cut edges, (not the fold) making sure they are tightly sealed. (you don’t want your filling leaking out when cooking). Place in a single layer on your cornmeal dusted tray, covering to prevent cracking and drying out. You can either cook at this point, or freeze them. If freezing, put them in plastic containers, or freezer bags. You will cook them frozen when ready to cook. When ready to cook, bring a large pot of salted water to the boil. Add a few at a time, overcrowding will cause breakage and sticking. When they float they are done. Put the cooked ravioli in a warm oven with a bit of sauce on the bottom of the dish. Continue cooking and adding ravioli in a single layer, adding sauce and cheese to each layer until all are cooked. Add your favorite sauce, homemade or jarred! This is so impressive when you have guests over. They won’t believe you made it yourself. I hope you will give it a try. REFERENCE: Lidia Bastianich “Lidia’s Family Table”. It’s been a busy weekend for us. Seems there’s never enough time in a day. Sometimes though, you have to put your own personal things aside to help others. Yesterday was one of those days! We attended a benefit dinner and auction for some people we know that just had a major house fire. She owns Millie’s Restaurant in Vienna. I feel it’s safe to say it’s an institution everyone in this area knows about. We saw the unfortunate aftermath since her , once beautiful, home sits next door to her establishment. What a mess! We were told a faulty ceiling fan started the fire. I can not tell you how heartwarming it was to see the outpour of people from far and wide. All, to show their support and let Millie and her husband know they were available to help in any way. The food was spectacular and what a spread. Steamed shrimp, shredded pork, coleslaw, cucumber salad, macaroni and cheese, cabbage, to name a few. It was an endless buffett. Chuckie Love, a local DJ, was there to help with the festivities. From what I saw and heard, a good time was had by all and for a very good cause. I applaud this community and everyone that came out to show their support. So today it’s time to get the yard cleared and ready for Spring. It is absoluely beautiful out. One of my dear friends reminded me “boating season is right around the corner.” She’s right…..so that’s my plan. In order to stay out and enjoy the day I decided to use my new “Instant Pot”. Pretty amazing gadget really. You can sauté, steam, slow cook, pressure cook, pretty much anything you need to do. I took an old WW recipe and turned it into an instant pot recipe. You can pressure cook, use your crock pot, or do it on the stove top. I was just itching to use my new toy. So here’s the recipe! Get outside today or go do something you love. Life is short, make every moment count, blessings to all. 1. Brown the meat, onions, and garlic on the saute setting of your Instant Pot, drain if needed. 2. Mix the cayenne pepper, taco seasoning, and ranch dressing mixes into the meat. 3. Add all of the other ingredients, without draining. 4. Set the Instant Pot on the soup setting. 5. Serve hot, topped with condiments of choice. Light Sour Cream, low fat cheese, avocado, baked tortilla strips, are just a few. Easter is right around the corner. Every once in a while my husbands birthday falls on Easter. This is one of those years! So with two events to celebrate, it makes it even more special to be with family and friends. I have been making this bread for years. I have also taught many people to make it. The last time I taught someone she asked me to break it down into specifics, so I did. This bread is a stunner and a lovely center piece on any table. I often make it to take when asked to bring something for the table, I also enjoy giving it as a gift with a good bottle of wine and a compound butter. I do suggest planning ahead if you want this for an event or gift. There are two rising times required. Every time I make this the rising time is different so it’s hard to put an exact time on how long it will take. I usually make it the day before. I am also an early riser and will get up early the same day and make it. Bread making is something I adore. Once you master a loaf, you can master any recipe, only the ingredients change. I am happy to answer any questions or help in any way. Just leave me a comment and I will get back to you. Happy bread baking! A joyous Easter to all! 1. In the bowl of your mixer add 1 C lukewarm water and 2 pkgs yeast, Stir once and let sit for 5 minutes until it blooms. NO BUBBLES MEANS DEAD YEAST! Stop and start again….if your yeast is dead your bread will not rise. 2. To your yeast mixture add ………. Mix all together until nicely blended. 3. Slowly add flour to the mixture until the dough starts forming a ball and pulls away from the bowl. 4. Flour a cutting board or bread board and turn the dough out onto the board and start kneading. Continue to add flour until the dough is no longer sticky, when you push your finger into the dough the indent should spring back. IT SHOULD FEEL LIKE A BABY’S BEHIND…LOL! 5. When you feel the dough is ready place it into the greased bowl and cover it with Saran. Place it in the Microwave (leaving the door ajar so light is on) or put it in the oven with the light on. 6. Let the dough rise until it is doubled in size. 7. Take the dough from the oven and PUNCH it down. Scrape it out of the bowl and place on your board. (I do not add any more flour at this point but if it is sticky you may have to). 8. Cut the dough with your bench scraper into 3 equal pieces. 9. Roll each piece into a rope and place on your sheet pan lined with your silpat. Cover with a non-fuzzy cotton towel and let it rest for 7 minutes. 10. Braid the dough starting in the middle and braid to the end tucking under the ends. Turn your pan and braid the other side to the end and tuck under the ends. 11. Let the dough rise again in the oven covered with the towel until doubled in size. 12. Remove the dough, Heat the oven to 375. 13. Brush the dough with the leftover egg wash and sprinkle with seeds as desired. 14. Bake for 10 minutes, turn the pan to the other side and bake another 10 minutes. If not brown enough add an additional 5 minutes. 15. WHEN IT IS DONE AND YOU TAP IT…..IT SHOULD SOUND HOLLOW! Let it cool and enjoy or wrap until ready to use. This makes great French toast, croutons, stuffing……..I never throw any of it away! Keep me posted on your future bread making. This can be very addictive!